Today the Parliament of the World's Religions is pleased to celebrate the public launch of a new PWR-allied organization: Religica. Developed for a broad audience, Religica was created by Parliament of the World's Religions Trustee and Board Secretary Dr. Michael Reid Trice and allies to produce original videos, podcasts, learning guides and articles. These works arise from a commitment to illuminating how faith and spiritual traditions are a force for good throughout the world, and promise to spark new and wondrous journeys for audiences across religious and interfaith movements. Visitors to the robust web-hub will find portals of Religica resources that are enriched by showcasing multiple dimensions of diverse human experiences— filtered through religion's expression in the lives and communities of its guests, allies, and contributors. The site includes projects accessible today, and will continue to blossom throughout the year with resources now in development. The Parliament of the World's Religions is proud to distribute It's About Time,a weekly podcast produced in partnership with our allies at Religica.org and Seattle University. Chaplain Colonel Khalid Shabazz, PhD. Colonel, Division Leader, & Muslim Chaplain in the United States Army. He is a featured guest of the podcast entitled, Honest Leadership and Knowing Oneself, which highlights how seeing oneself is honest and courageous – and opens up the world. Rev. Anne Van Kley, M.Div is a Christian pastor in the none-zone of the Pacific Northwest. She is the guest of the podcast entitled, We Lead Beyond Blame by Doing Hard Things, which discusses the role of women leadership and the liberating power of gratitude. Taijo Imanaka is the Head at a Koyasan Buddhist Temple. His podcast premiering today entitled Leadership Begins Within, Like a Lotus Flower, reflects upon responding to violence and the resilient beauty of being a lotus. 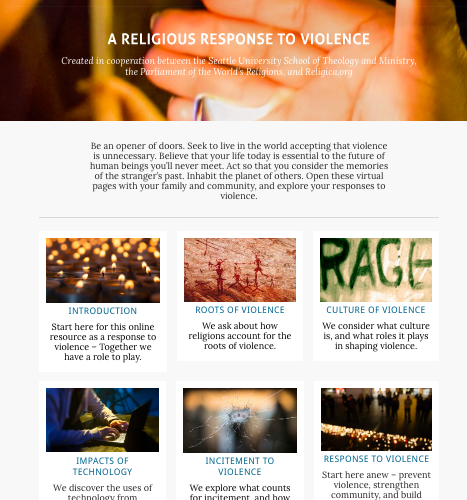 The Parliament of the World's Religions is also allied to Religica.org on the launch of the robust web platform Religious Response to Violence, featuring videos, tools and resources exploring the religious landscape and the lives of those who interact across questions, theories and experiences of violence.